A weeklong celebration of Russian culture has just finished in London. The audience is on its feet, chanting for another encore. The grand piano is put through the paces again, but the applause doesn’t stop. This is the finale of London’s popular Maslenitsa festival, a weeklong celebration of Russian music, dancing and pancakes. The week is drawing to an end with a gala concert in the massive Cadogan Hall, and the vocal quartet Kvarto wraps up the evening with a performance of some of their most rousing songs. The concert also featured performances of traditional dances, Ingush folk songs, accordion music, ballet and opera, all to a backdrop projecting images of everything from birch trees to Gzhel pottery, from aerial shots of Red Square to the Caucasian mountains. The Russian Orthodox Maslenitsa festival, which marks the end of winter and the beginning of spring, has its origins in pagan sun worship. Every year since 2009, Russian pianist and producer Olga Balakleets has organized a weeklong celebration of Russian culture around London to coincide with Maslenitsa. This year’s festival included an impressive series of musical, cinematic and other events, along with a reception in the House of Commons. The next day brought a fashion show featuring hats by Russian designer Maria Zherebtsova, along with the opening of an exhibition of photojournalism by Yuri Abramochkin. On Feb. 21, Alexei Zimin, one of Russian’s most famous chefs and owner of the popular Moscow restaurant Ragout and Russian street food bar Zima in London, cooked up a seafood and venison honey cake with vodka. The Maslenitsa menu included complimentary homemade liqueurs flavored with fennel, tarragon, lingonberries and even curry leaves. Zimin also put on a family friendly Sunday lunch with stacks of pancakes. On Feb. 22, Pushkin House hosted a screening of the 2012 romantic film Rita's Last Fairy Tale and a folk concert by Timur Dzeytov playing the dakhchan pandar, a traditional Ingushetian stringed instrument. On Feb. 23, Moscow-born singer Daria Kulesh performed another Ingush-inspired concert in North London, and the East London cinema Rich Mix, along with Radio Gagarin, hosted an evening of films, food and music. Kulesh and Dzeytov also played together at Cadogan Hall in a haunting performance with images of the mountains of Ingushetia shown in the background. Toward the end of the performance, guests were singing and clapping along to old favorites as “Dorogoi Dlinnoyu” — better known in the UK as “Those were the days.” Vladimir Filippov, Deputy Head of Moscow’s Department of Culture, was in London to enjoy the Maslenitsa festivities. “When we cooperate, it is a win-win story,” he said. If the crowd in Cadogan Hall was any indication, Maslenitsa brought some warmth and excitement to a chilly February in London. The performers were a swirl of red silk and silver spangles, Cossacks in turquoise shirts and folksingers in flowered shawls. If, after all this, Londoners find themselves craving more Russian culture, they can attend a stunning and highly praised new exhibition on the Russian avant-garde at the Royal Academy. 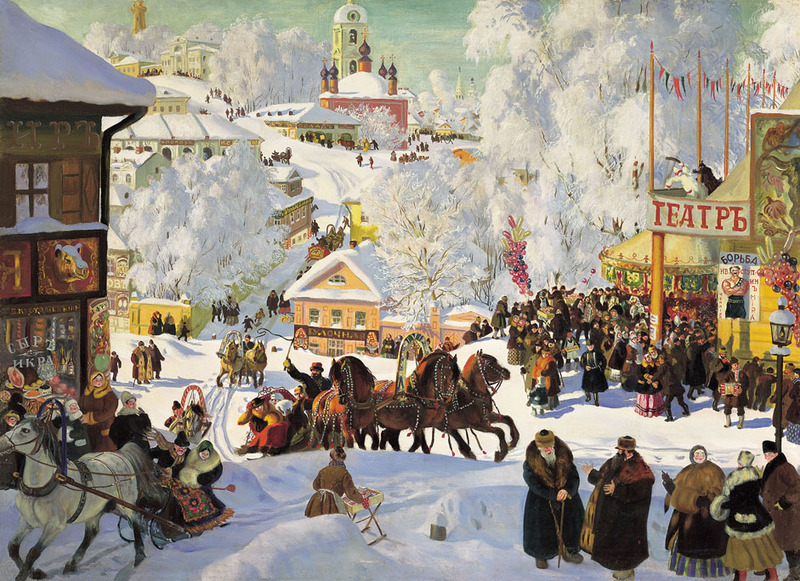 Find more information about Russian Maslenitsa in London at the official website.